As you will all by now know, I absolutely love BakedIn. I came across them when I was reviewing the Degustabox subscription boxes. One month there was a BakedIn mug cake mix included. Being brutally honest, my opinion of “packet mixes” has always been rather negative, so I had decided in my head that the mug cake mix would be vile. Degustabox had once included some mug cake mixes from another big brand and they had been just as I expected… horrible, weird textured and artificial tasting. I made the BakedIn mug cake expecting to have a tiny spoonful and throw the rest away. Well that didn’t happen!!! It was absolutely scrumptious and tasted just like a baked-from-scratch cake. It disappeared in seconds! There had been a voucher included too to join the BakedIn Baking Club, which I did purely on the strength of how beautiful the mug cake was, and I haven’t looked back since. I love them! I was very lucky recently when BakedIn asked me if I would like to try one of their newer baking kits and write a review of it. Obviously I jumped at the chance! 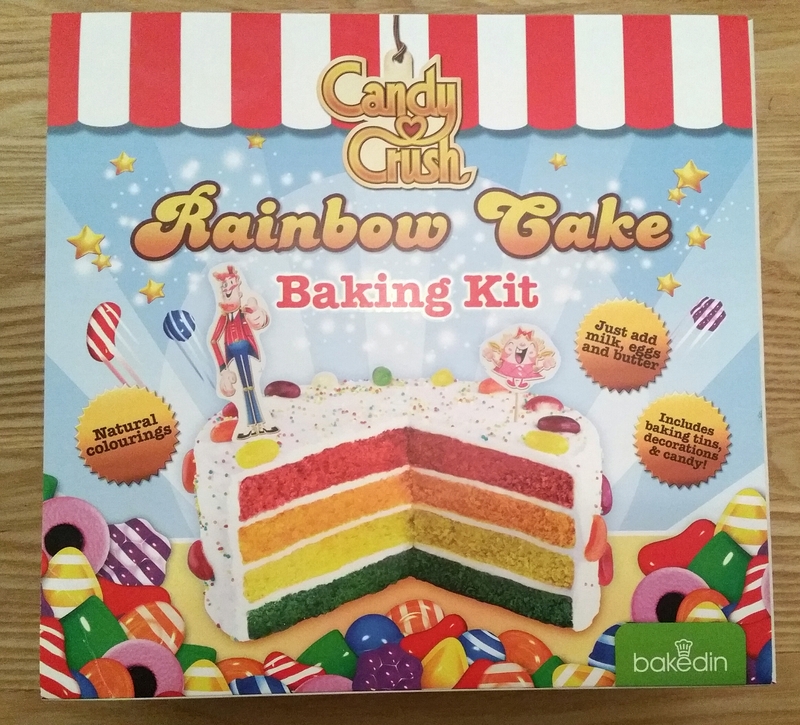 The Candy Crush Rainbow Cake Baking Kit really really impressed me. It contains all the dry ingredients you need to create a beautiful cake of 4 different coloured layers. All you need to provide is milk, eggs and butter. Apart from all the dry ingredients, the kit also comes with sprinkles, sweets and Candy Crush characters to decorate the cake with, which is a lovely touch. That’s not all though. It also comes with 4 disposable baking tins to bake the cakes in, baking paper circles to line the tins with, a cake board to display/serve the cake on, and a butter guide (which as I showed in THIS POST is amazingly accurate). There is a very easy to follow recipe card included too, and all of BakedIn’s recipes are pretty much foolproof. Literally anyone can make a wonderful looking and tasting cake with this kit. I had a look on a large supermarket’s website at their own birthday cake range and decided to read some of the reviews of them. So many had very low star ratings and complaints (of which there were a lot) included “dry”, “tasteless”, “so bad not one person finished the cake”, “tasted artificial”, “terrible”, “heavy”, “won’t be buying again”, “revolting”, “inedible”, “horrible aftertaste”…. hmmmm, it doesn’t make you want to rush out and buy a shop-bought cake for your child’s birthday, does it? Sometimes you just don’t have the money to get a cake made specially either. 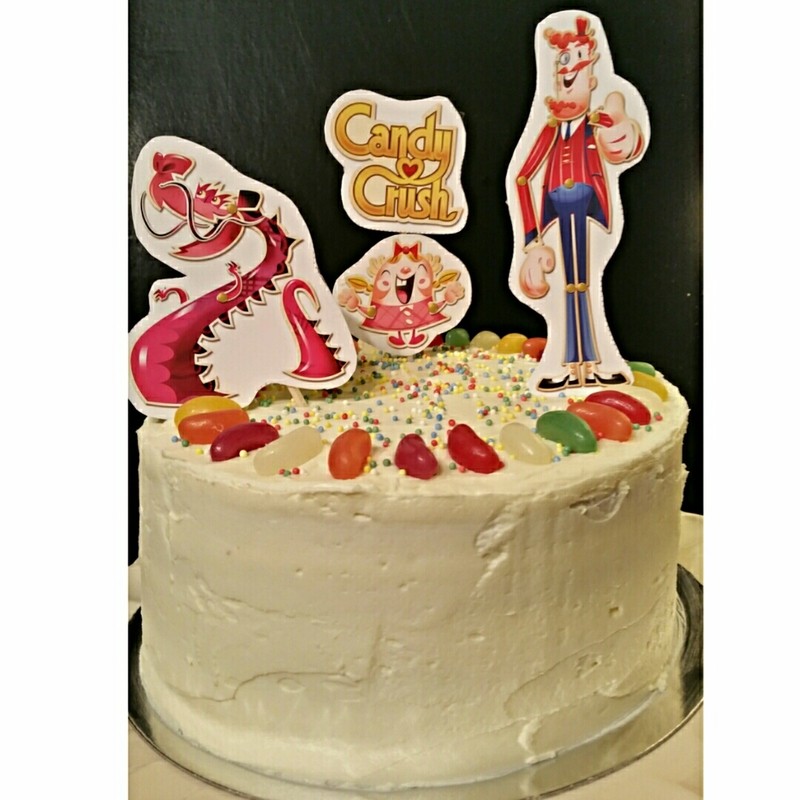 The Candy Crush Rainbow Cake is the perfect way to guarantee happy children on their birthdays. It costs just £14.95, but remember that includes equipment too! It serves 12 people comfortably with good sized portions. So, how did I get on with making my Rainbow Cake? Well I wanted to show how easy it is for anyone to do it. I make lots of cakes so have lots of fancy bits and bobs to make cake decorating easier, but I decided I wasn’t going to use anything special to make this cake. I wanted to prove that, with no professional tools, it is easy to make a cake to be proud of and that your child will love. Grown ups will love it too! I made the 4 coloured sponges first, and then made the buttercream while the cakes were cooling. I followed the instructions on the recipe card to assemble the cake and used the back of a normal dinner knife to spread the buttercream on. Normally I would use a spatula and a scraper to make sure it is all perfectly smooth, but as I said, I wanted to show you can do it with just everyday items. You don’t need to buy any equipment at all to make a fabulous birthday cake. You can decorate the top however you want. 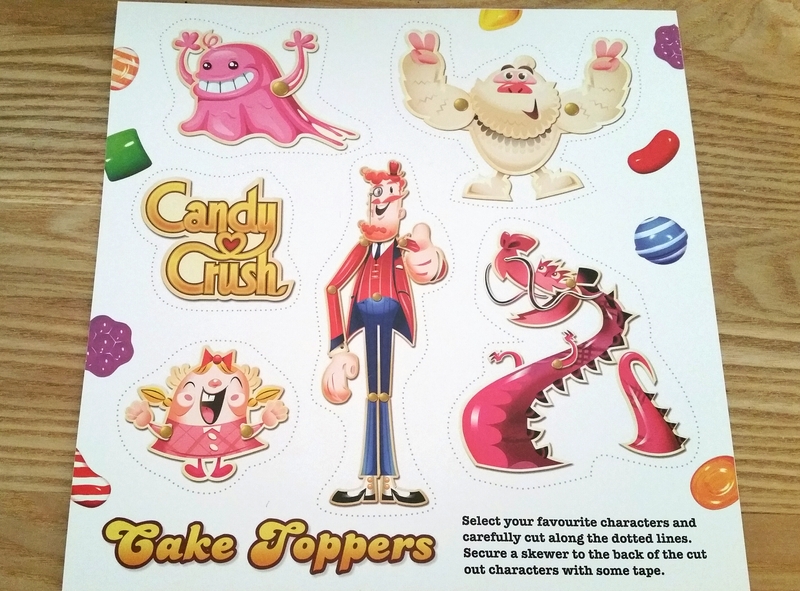 the kit comes with a sheet of cardboard characters, and you just choose which ones you want to use, and attach them to baking skewers (included too). You don’t need to use these if you don’t want to. You can just decorate with the sweets, or if your child has a favourite TV programme or something like My Little Pony, you could place some (sterile) models on top. Here is my finished cake. I chose just a few of the characters and all of the sweets! I can honestly say it tasted amazing! The sponges were light as air, and the buttercream was perfectly smooth. No graininess like you can sometimes get in buttercream. It all tasted homemade. 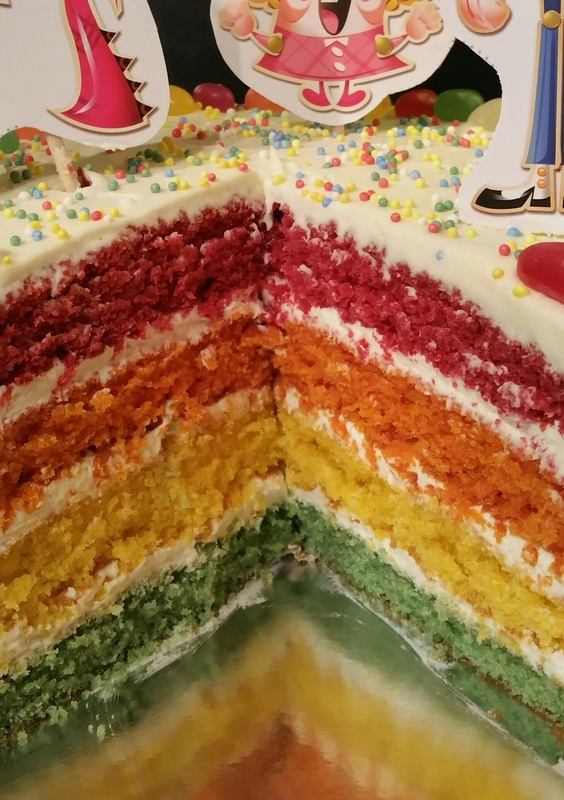 There are no artificial flavourings or colourings in this cake, and you can tell! It had just the most delicious flavour, and was sweet but not sickly sweet like some shop-bought cakes can be. I can truthfully highly recommend this kit. No more excuses…. you CAN make your child’s birthday cake, and everyone will love it. Try it and see! If you want to make one yourself to see how easy it is, you can buy them directly from BakedIn HERE. Let me know how you get on! DISCLAIMER: I received the kit for free in exchange for an honest review. I only ever say the truth in my reviews anyway. False information doesn’t help anyone. I only recommend products and services I genuinely think are worth it, and BakedIn and the kit are both definitely worth it! I receive no compensation (apart from the free kit) for my review, and no commission if you buy the product. Thank you for reading.